It's almost time for the World Meeting on Sexual Medicine! We hope you'll join us in Lisbon February 28 - March 3, 2018 to connect with other sexual medicine specialists from around the world. 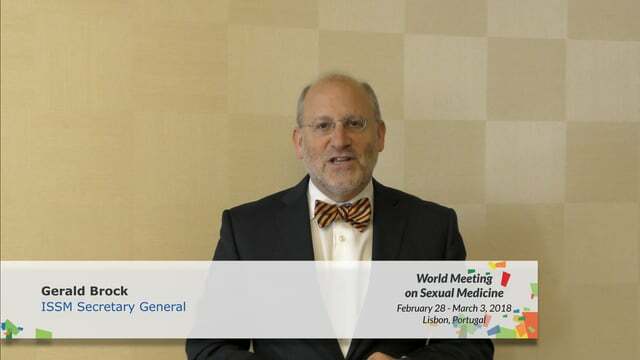 In his video invitation, ISSM Secretary General Gerald Brock discusses two ICSM topics: Testosterone replacement and sexual function after radical prostatectomy. Men with Peyronie's disease may have increased risk for certain cancers when compared to men with erectile dysfunction (ED), research suggests. The study of over 1.7 million men in the U.S. was based on insurance claims filed between 2007 and 2014. The average age of the men was 49 years. Scientists found that men with Peyronie's disease were at higher risk for stomach cancer, melanoma, and testicular cancer. However, they acknowledged that theirs is the first study to find a link between Peyronie's disaese and cancer and that more research is needed. The findings were presented at the Scientific Congress and Expo of the American Society for Reproductive Medicine held in San Antonio, Texas, USA last October. Please see more details here. Men with sleep-related painful erections (SRPEs) can wake up with an aching erection several times each night and often suffer from sleep deprivation and daytime fatigue. "Outcomes Of Inﬂatable Penile Prosthesis Insertion in 247 Patients Completing Female to Male Gender Reassignment Surgery" by Marco Falcone, et al. was published in October in BJU International. The study discusses the experiences of 247 individuals with gender dysphoria undergoing a female-to-male surgical transition. The patients received penile implants after total phallic reconstruction.